” Types Of Animal Cruelty Adverts contribute towards site running costs, but currently may not fit with the site ethos. We will continue to work on a solution. In Many Instances, Horrific Cruelty Is Perfectly Legal - Even Encouraged! On this page are links to pages about many different types of animal cruelty (see table of contents, below). Even if you only read the short introductions on each of the pages, you will be more knowledgeable about the animal cruelty going on, and therefore better equipped to help stop it. Many people bury their head in the sand, saying “I don’t want to know!”. Sadly, this inaction only helps animal abusers, because they can continue their cruelty unhindered. Every single second throughout the world, humans are causing enormous numbers of innocent animals pain and terror worse than you or I could ever imagine. THINK THERE IS NOTHING YOU CAN DO TO HELP? There is something suitable for every type of personality and circumstance in the Help Stop Animal Abuse and Suffering section of this website. Many of the ways do not cost, and are hardly any effort to do. It does not matter if you have no money to donate, how sociable or shy you are, are confident or not, or whether you like to stay at home or be out and about, etc. There is something to suit you. Many, many more people are DESPERATELY needed to help end animal cruelty, even if they can only do something small. If you would like to see many different ways you could help stop animal cruelty and suffering, click here. When people think of animal cruelty, they often think of violence inflicted on an animal. However, a common form of animal abuse is neglect. Then there are the people that know about the abuse but do nothing to stop it. They are also guilty of cruelty to animals because they allowed the abuse to continue without reporting it or saving the animal from it. Page Description: The fur trade is one of the cruelest on earth. Animals are skinned alive for their fur after being crushed in to tiny cages for months to await their fate. They are injured while roughly treated in transit, but left to suffer with broken bones. Page Description: The facts of dog fighting: The horrific abuse inflicted on the dogs by humans, despite the agony they suffer when forced in to fights when desperately trying to survive and please their blood thirsty owners, frightened of the sometimes fatal torture they receive if they disappoint them. Page Description: Animal experiments are extremely cruel to animals and dangerous to humans as they are so unreliable. Humane methods of testing products, not involving animals, is much safer. Think about how often you hear about a promising new drug that is “expected to be available in about 5 years time”, but then never hear of again. This is because at the animal testing stage the results were encouraging. However, humans respond so differently that the same drugs can be found to be useless or harmful to humans. By buying or using products from companies who test on animals, people are funding and supporting the hideous cruelty, some of which is explained on this page. Page Description: Crush videos are videos of animal cruelty showing innocent puppies and kittens being slowly crushed to death under the feet of women for the viewing pleasure of sick and depraved individuals. Page Description: There is so much unseen cruelty behind Greyhound racing. If the dogs are not making money they are usually no longer wanted. They are often inhumanely and callously killed, neglected until they die, or are abandoned. They have sometimes had their ears cut off without anaesthetic so their owners cannot be traced through their racing tattoos. Page Description: Every single day countless new cruelty cases are discovered where the extent of animal suffering purposely caused is sickening. Many cases will never be discovered. The cases on this page are just a tiny portion of the horrors that happen every day to numerous innocent animals who are completely undeserving of such malicious, vicious acts. They are examples that serve to remind us why we need to do all we can to help stop animal cruelty and suffering. Page Description: The use of animals, including endangered species, for Traditional Chinese Medicine, involves horrific cruelty. It threatens the survival of endangered species and causes a life of misery and agony for many animals because the trade is so lucrative to poachers. Page Description: Millions of cats and dogs are eaten in countries across Asia. How the cats and dogs are treated and ‘prepared’ is absolutely brutal. Their fates can involve being severely beaten, skinned alive, boiled / baked / cooked alive after horrific treatment. Page Description: What the meat industry doesn’t want you to know about the terrible cruelty & suffering inside slaughter houses. This page reveals the horrifying animal abuse that is common place in the meat industry that every meat consumer is funding. There is also the illegal meat trade which can be fatal to humans. Page Description: This page is about the suffering and misery caused to farm animals trapped in to a life of factory farming. Page Description: Cruel measures to control animal overpopulation are legal in different countries, causing animals terrible prolonged suffering. 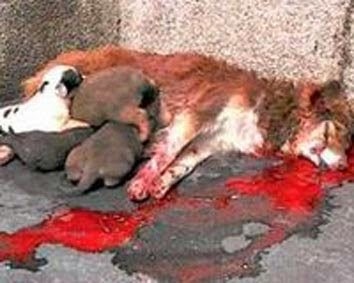 In some countries, citizens are be paid to kill stray dogs in cruel, barbaric ways. In others, they are burned alive – all despite humane methods of controlling the population being no more expensive. 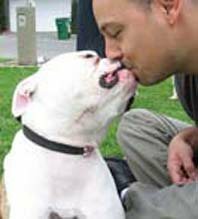 Page Description: Breed Specific Legislation (BSL) is where law makers order the deaths of millions of gentle, innocent dogs, that have never done anything wrong, JUST because they are a certain breed. It has already in force in the UK and is a constant threat in other places. Page Description: There are sadistic Spanish festivals involving the terrifying & torturing to death of innocent animals. Other countries also have horrific traditions like this, such as the Brazilian Festival Farra Do Boi, detailed on this page too. Page Description: Puppy farms and puppy mills are cruel prisons full of suffering that are only interested in profit and not animal welfare. They supply pet shops & kill breeder dogs after abusing them all their lives. Customers of these pet shops who buy these puppies fund this cruelty and abuse. Behind the scenes, animals suffer horrifying cruelty and suffering to make pet shops money. Page Description: Millions of pets are abandoned every year and only a tiny proportion of these are adopted. This results in millions of innocent loving pets being put to death, often in horrific ways, every year. Page Description: Horse racing causes many horses to suffer terribly. From horses forced to race that die on race courses, to ones killed, abandoned & neglected when no longer of use. The majority that don’t make the grade, or that retire, end up slaughtered for the horse meat industry. Page Description: This page provides information about illegal poachers brutally killing wild animals for meat, endangering species. Page Description: The fourth biggest illegal trade in the world, which funds organised crime and leads to extinction of endangered species, this trade causes unimaginable cruelty and suffering to its animal victims. Page Description: With rhino horns being worth more than gold, poachers are quickly driving the Rhinoceros to extinction using brutal methods, causing each Rhino horrific suffering. Page Description: Because of the lucrative illegal international ivory trade, enormous numbers of elephants are brutally massacred ever year for their tusks, funding organised crime, leaving young orphaned elephants, & elephants as a species fast becoming extinct. Page Description: Because of the luctrative illegal international ivory trade, scores of elephants across Asia and Africa are brutally massacred ever year for their tusks, leaving their young orphaned, & elephants under threat of extinction. Page Description: Canned hunting and trophy hunting is where companies trap wild animals in enclosed areas of varying size, sometimes tame and drug them to make them slow and less afraid of humans, and then accept large payments from individuals who want to kill them or fun. Page Description: Find out how animals involved in animal related tourism suffer due to tourists funding the industry. Page Description: Electric shock dog collars are used to try to stop dogs barking, or to discourage other unwanted behaviour. However, faulty collars, or misuse of the collars by children who know no better, or by cruel people, can cause burns, life long anxiety & great suffering to pets. Page Description: Find out about the terrible suffering animals are made to endure when part of a circus. Page Description: People who perpetrate human violence often begin by torturing animals, often in their youth. If someone is cruel to animals, it is a warning sign that their behaviour could escalate. Even though other animals feel fear and pain, just like humans, and although it is thought that many animals have a capacity very similar to that of a small child, sentences for animal abuse do not reflect that. They are extremely lenient and not at all a deterrent. In many countries, horrific animal cruelty is perfectly legal, and some countries actually encourage it! See the Breed Specific Legislation, Cruel Animal-Overpopulation Controls page and Festivals & Other Cruel Traditions Worldwide for some examples. In fact, a lot of the pages in this section are about animal cruelty that is legal in some places where it takes place, including Canned Hunts & Trophy Hunting, Pet Abandonment, Festivals Of Animal Torture And Other Cruel Traditions Worldwide, Cruel Animal Overpopulation Controls & Attitudes Worldwide, Factory Farming, From Farm To Slaughter House: The Horrifying Cruelty, The Cat & Dog Meat Trade In Asia, Fur Farming, Greyhound Racing, Horseracing Abuse, Crush Videos, and Animal Experimentation. Some of this cruelty is even Government funded and subsidised. For millions of animals in the fur farming industry, their fate is having all their skin sliced off their bodies while they are ALIVE, after much prior abuse. Amazingly, some animals are still alive, in absolute agony, up to ten minutes after being fully skinned. Cruelty to animals in Asia is appalling, with dogs and cats being boiled ALIVE and eaten as food, (see The Cat & Dog Meat Trade In Asia), after being beaten to “tenderise” the meat whilst alive. Traditional Chinese Medicine uses animal ingredients, including from endangered species. This encourages poaching and leads to lives of pain and misery for millions of animals. One of many festivals and other cruel traditions involves throwing terrified live goats off the top of high towers. That is entertainment?! Dogs involved in Dog Fighting are so desperate to please their owners that they are willing to put up with tremendous pain. They are then rewarded with the cruelest of deaths at the hands of those owners. Chicks are thrown in to mincing or grinding machines and are ground up alive, just for being male or of no use to the egg laying industry, as seen on the Factory Farming page. 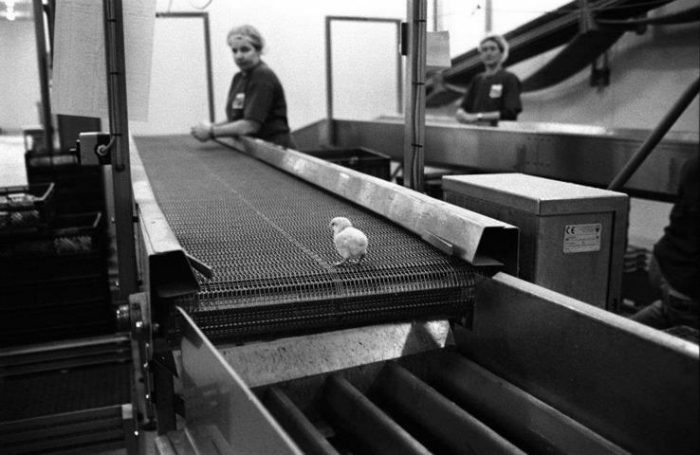 Image: Animal Cruelty – in Factory Farming: The grinding up of male chicks ALIVE can happen in any country. In the US & UK it is a legal & accepted “humane” practice. Live male chicks are also crushed, left to die, suffocated, or used as padding in packaging in the poultry industry, dying during transit & on arrival. The vast majority of female chicks go on to a life of misery, driven to self harm in the tiny battery farm cages, only let out to face the terror of slaughter. Greyhounds are abandoned, having had their ears cut of with no pain killers so their racing tattoo cannot identify their owners, dieing from the infection. Alternatively they can be killed in the cruelest of ways, just because they are no longer making money for their owners by Greyhound racing. Only a very small fraction of greyhounds make it to rescue to be re-homed. If you would like to see what you can do to help stop this abuse, please go to the Help Stop Animal Abuse And Suffering page. You do not need to have money to donate in order to help, or be outgoing or anything like that – there are lots of things you can do. Image: Animal Cruelty – In Brazil’s Festival, Farra Do Boi, oxen are tortured in the worst ways thinkable, for many hours, before they can take it no longer and succumb to death. For more information and for details of what is shown in these pictures, please see the Festivals Of Animal Torture And Other Cruel Traditions page. 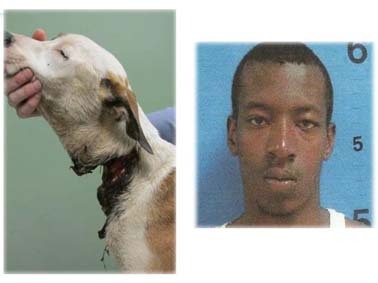 Image: Animal Cruelty – To see the story behind this picture, including where to contact Monterion Dionte Davis to tell him what you think of him, go to the Individual Animal Abuse Cases page. More despicable acts of animal cruelty can be be found on the same page, high-lighting the need for us to do all we can to help stop animal abuse and suffering that is happening every minute of every day to millions of innocent animals. If you would like to see what you can do to help stop this abuse, please go to the Help Stop Animal Abuse And Suffering page. You do not need to have money to donate in order to help, as many of the ways you can help are free. What kind of personality you have does not matter either and many are not hard work at all. Please just have a browse.